Where does an album that’s simultaneously old, new, the same, and decidedly different, fall in the spectrum of creative musical invention? Math rockers, TTNG (formerly known as This Town Needs Guns) have chosen to tackle this question by dusting off the album that put them on the math rock map back in 2008: debut LP, Animals (Big Scary Monsters Recording Company / Sargent House, 2008). However, is it worthwhile to – as much as such a decision would be understandable – simply react to this anniversary release with a comparative ear and to remark on why creative choices on this notably re-imagined rendition of Animals did or did not work? Though there’s total accuracy in noting the two-week turnaround of this acoustic take on Animals, it would be a disservice to believe that not much in the way of surprises or bold decisions will await in-between the grooves of the limited press, translucent green vinyl the band had printed just for the occasion. The thought of a dynamically textured set of songs getting an unplugged treatment and a quick recording job might incite some skepticism but the reality of what Animals Acoustic delivers, presents it as entirely opposite of that. It’s a sonically multi-faceted, pristinely recorded, and compositionally poised piece of work which, rather than feeling like a minimal effort for nostalgia-fueled fascination, offers a cornucopia of uncommon arrangements over just playing these existing songs without amplification and electronic alteration. This approach alone makes Animals Acoustic approachable as its own record. Those going into it without a point of prior reference won’t be left adrift in a sea of expectations. 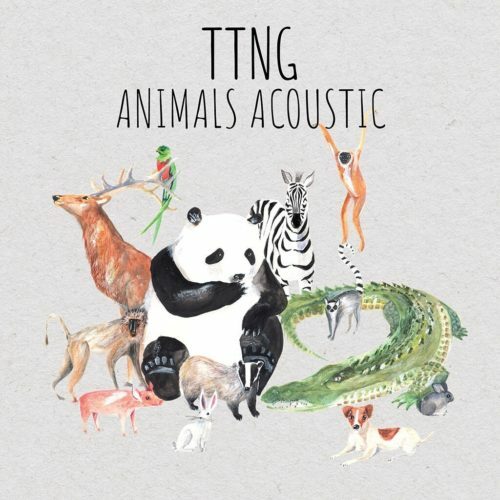 Now, whether a person is listening to TTNG for the first time ever with Animals Acoustic or, back in 2008 when a now long-time fan cued up the debut album of a brand new band, in either case, the impending impression is there to be made. And when it comes to a genre like math rock, a striking set of words can really serve to enhance already intricate instrumental performance. Keeping in mind that there were no albums for TTNG prior to Animals back in 2008, both of these opening statements made for intriguing introductions but now that it’s 10 years later, it’s almost a shame not to have what would be that properly fitting and charming moment of recollection summed up in “Pig’s” beginning. Yet that’s the beauty of time and recall. U.S. fans who missed out on having “Chinchilla” be the kick off to their relationship with TTNG can now revel in its easy-going but nimble jaunt, as well as look forward to soaking up a fan favorite right out of the gate. Meanwhile, those particularly in the U.S. who are totally uninitiated will be privy to a listening experiment of sorts, in hearing this album as it was fundamentally arranged. Though this detail might seem negligible, track lists can influence everything from the dynamic level, emotional atmosphere, and narrative flow of an album so recognizing that everyone will get something out of this shift is worthwhile to say the least and demonstrates some foresight on the band’s part, even before a single note is played. When finally settling in to experience Animals Acoustic, what does greet listeners is something of a kaleidoscopic listening experience, where the songs are constantly turning out fragments that catch your ear, the way small but noticeable shapes catch your eye in tumbling and ever-changing reflections. TTNG’s math rock crux, the astute and signature guitar work by Tim Collis, acts like the fragments here, as Tim Collis’ finger style and intermittent harmonic tapping throughout the album is at once precisely structured and also a key element not often capable of being anticipated (save for that segment of the fan base that scrupulously studies TTNG’s official guitar tab books.) The deluge of light and quick plucks come and go like identically comprised rain drops that each fall from the sky but hit the ground in different fashions from one another. Stuart Smith, who reprises his lead vocal role for the album, sings with a voice quality that is at times calming when he sings with pitched restraint and minimal dynamic force on tracks like “Crocodile,” “Rabbit,” and the almost shy closer, “Zebra.” The melodic intent never leaves his voice – this is no spoken word or whispering affair – but there’s a sort of indoor-voice attribute to parts of songs; similar to someone casually singing to a friend sitting in the room with them. Then on songs like “Badger,” and “Panda,” most dynamic intensity gets swapped in, along with a cleanly pleading delivery that is either asking questions (“So what if I should forget to breathe?”) or making loud declarations (“I’m in love”). While Animals Acoustic doesn’t come up anywhere short on instrumental grandiosity, the acoustic nature of the music allows for this subtler take on TTNG’s vocal components without Smith’s voice going to battle with any extra attack and tonal bite that might accompany an electrified approach – especially given that much of the guitar work deals with higher pitched notes and therefore, much more sharply defined and sound cutting tonality. There are other times, during songs where the signature guitar and-or Smith’s voice don’t enter from the beginning or are not the cornerstone of the melody, that one would view Animals Acoustic as a work channeling contemporary orchestral or indie folk inclinations. Though the acoustic guitar is what it is throughout; on a song like “Baboon,” it behaves much in the manner of a math rock instrument. Fast, complex, and continuous notes flutter all around the song’s start and the idea of, “this is math rock guitar unplugged” does feel most appropriate. Yet, pull up a song like “Elk” and even though there’s no loss of impressive performance, Collis’ style has moved away from attack heavy and decay-light notes to those which are given room to breathe and sustain. The melody itself is of a slower tempo, and the distinct openness of overtones is sewn between more easy-going arpeggiations. If it weren’t for the gallant character of the trumpets within the piece (a gorgeous component unto itself), the song would slide without notice, into the library of anyone with a love for classical finger picking and instrumental folk. The recurrence of strings across Animals Acoustic – whether the choppy and blunt bow strokes midway through “Panda,” the pitch fluctuating pizzicato weaving in-between the busy acoustic guitar on “Rabbit,” or the slow but elegantly legato harmonizing cello notes that act like tempo and tone counterparts to the higher pitched guitar and Chris Collis’ heavier dynamic percussion – give the record sonic polish, without an ounce of overblown reverb or sound expanding technology to try to forcefully puff the band up bigger than it is. After the additions of Nate Kinsella, the Mivos Quartet, the Kraken Quartet, Yvette Young (Covet), Andy Hume, and Vicki Tremaine, there’s no shortage of collaborative input so, digital enhancement, even in production, is certainly nothing that’s missed. (It’s interesting to observe that Young, who is known herself for skillful finger work with the guitar, contributes most drastically, using the piano for “Crocodile’s” primary melodic source.) While “Dog” sounds more like it’s set to be a “Vitamin String Quartet on TTNG” affair until Smith’s voice kicks in, even then, the whole song is vibrantly propelled by the Mivos Quartet in a way that drastically contrasts with TTNG’s more sonically edgy presentation. The vocal-less winding down of the song still seems to jump around a bit and even feels like a character all its own; not straying too far off from the kind of quaint and friendly classical arrangements that complemented many an animated or audio adaptation of classic children’s fairy tales or short stories from times before CGI kids’ videos on YouTube. Animals Acoustic is out now via Sargent House. Stream on Spotify and Bandcamp. TTNG are currently on tour in the US celebrating the 10th anniversary of Animals and will be in New York City on 16 October. Full show details are below. Christopher Bingham and High Five Spaceship: Shooting to the stratosphere with “Pathfinder”!